There are plenty of people around the world who love cats – with over 600 million of our furry friends currently estimated to be in existence throughout the globe. 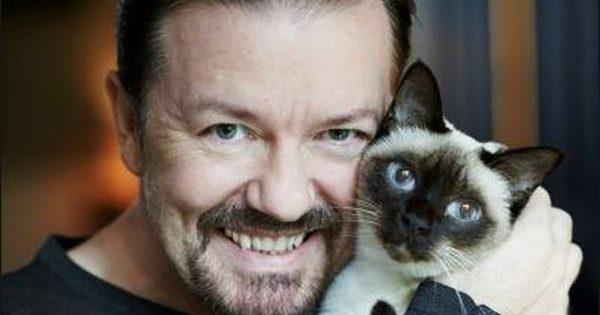 Here are some of the more famous people who have got it bad for cats. The 56 year old funnyman from Reading shot to fame in the 1990s with his portrayal of hapless David Brent – everyone’s worst nightmare as an Office manager. Less well-known is Ricky’s love for cats, as demonstrated by this pic. Looks about purrfect to us! 32 year old Californian singing superstar Katy became world famous in 2008 with her dance anthem “I Kissed a Girl”. A string of hits followed, with possibly the high point of her career so far being her Superbowl Halftime performance in 2015. Seems fur enough! Perhaps one of the more unexpected names on this list, American film star James got his first break into acting in a Pizza Hut commercial in the late 1990s. He’s appeared in many more successful productions since then, receiving nominations for both an Oscar and a Bafta for his performance in 2010’s “127 Hours”. A film that showed it’s not only cats that have 9 lives! Another of the Californian natives on our list, 30 year old Kesha originally styled her name with a dollar sign in the middle – Ke$ha. Despite her successful singing career, Kesha has struggled with addictions and lawsuits over the years. But we’re sure the positive reception for her 3rd album earlier this year has left her feline better now! 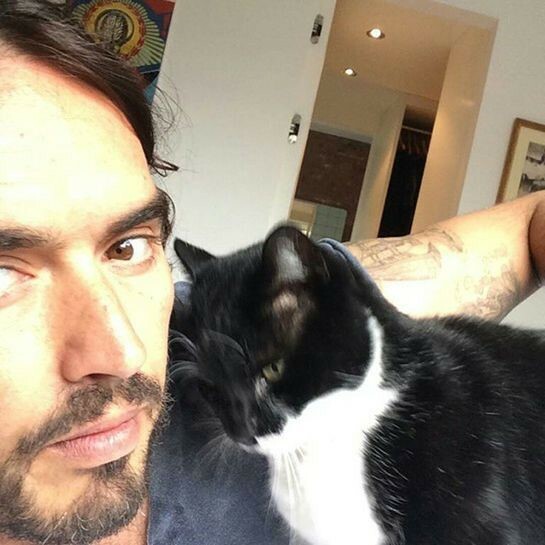 No stranger to his own internal battles throughout his life and career, the former Mr Katy Perry (already featured in our list) is also a cat lover. The 42 year old Londoner started off as a controversial standup comic, before branching out into presenting, acting and writing. Indeed, many of his books have certainly given us some paws for thought! And another one born in California – maybe there’s something about being brought up on the West Coast of America that turns someone into a cat lover? Whatever it is, this 45 year old former model turned actress has appeared in many successful films since her debut playing the lead in the Jim Carrey vehicle, The Mask, in 1994. Certainly not a cat-astrophic choice of role choice there! Maybe not so well-known nowadays as some of the others on this list, Ernest Hemingway was one of the most influential authors of the 20th century. 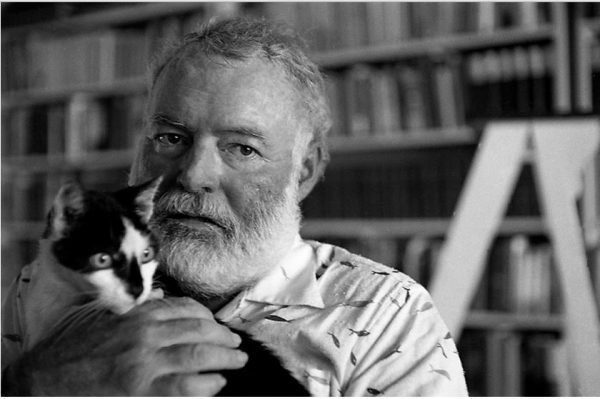 One of a select few writers to have won both a Pulitzer prize and a Nobel prize, Hemingway even has a type of cat that is often called a “Hemingway Cat” after him – the 6-toed polydactyl cat. Which makes him cat-egorically deserved to be featured here! Yet another California native, 36 year old Kim shot to fame in 2007 in the reality TV series – Keeping Up With The Kardashians. (Though she had previously featured in a leaked home video of a rather more intimate nature!). Since then, she’s become one of the most famous social media celebrities in the world. Fur real! A 33 year old New Yorker, he made his TV debut in US TV series, Get Real, in 1999. 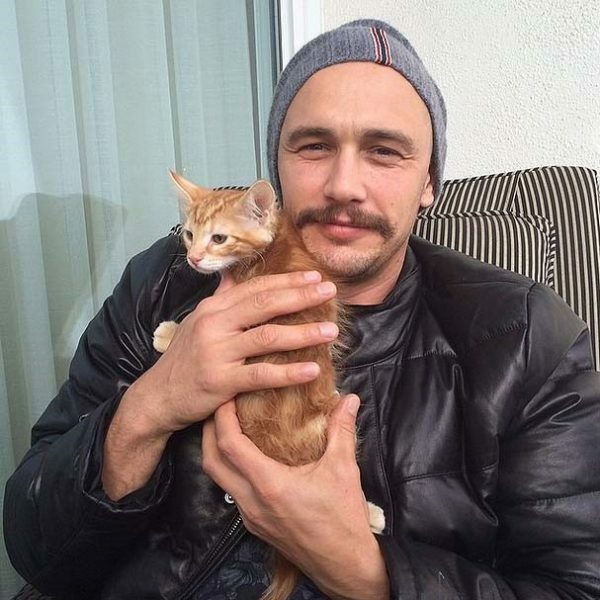 Like another member of this list – James Franco – Jesse was nominated for both an Oscar and a Bafta for one of his films, The Social Network (in which he played Facebook founder Mark Zuckerberg). More recently, he played an updated incarnation of Lex Luthor in the 2016 film Batman vs Superman. A purrticular favourite of ours! A Pennsylvania-born singer songwriter with many hit singles to her name, 27 year old Taylor was well-known on social media for her love of cats – before her infamous temporary withdrawal from Facebook, Twitter, Instagram etc in the summer of 2017. Just a publicity stunt? Quite pawssibly!